Does High Bounce Rate is Bad for Website's Credibility? Do you still think High Bounce rate websites have no future? If yes, then think one more time. This is one of the biggest myths created by fellow Pro Bloggers to waste Newbies talent and time in uneventful activities. Bounce rates could affect your credibility only if the average visit duration is on a lower side. Other than that, having a website with High Bounce rate has no harm whatsoever. However, few people consider it as a deadly act for SEO, but it has nothing to do with Search Engine Optimization. This is the reason, why today we will be replying to a million dollar question that Whether a Blogger Should Worry about a High Bounce Rate website or not? What Does the Term “High Bounce Rate” Stands For? 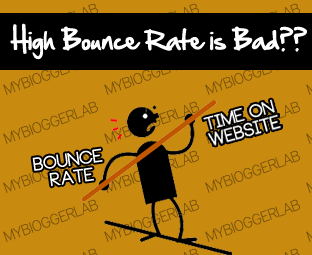 Before we get further, and things get more tensed let us first clear what does high Bounce Rate Means. Well, it is extremely straightforward to understand the meaning of bounce rate. It’s a percentage of visitors who arrived at a website, and left it without navigating or visiting a second page. The main idea behind designing Bounce Rate was to check whether a person is receiving correct audience. Let us sum up the meaning of Bounce Rate, I Came, I learn and Left. What is High Average Duration Time of Visitors? It is not extremely difficult term people can understand it quite easily. It is the percentage of time that all visitors spend on a website before leaving or navigating to different pages. For Example, 100 visitors arrived on a website few people spend 10 minutes while few spend 5 minutes so the average duration of the visit would be in between 10 and 5 which is quite impressive. To clear the concept let us first consider one example. Consider a visitor arrived on a website through a search engine. He enjoyed each and every word of the article because he was looking for the same article from hours. However, in the end he left the website without navigating to other page. The reason behind not visiting any other page was that, he got what he was looking for so why he should waste more of his time in going through a website in depth. After going through the facts, many webmasters still has the audacity to disagree. However, everyone has their own opinion but, as always facts are facts. Consider the following screenshot in which we can clearly see that a website has a high Bounce rate but the average duration of a visit is superb. (The following screenshot is captured from Google Analytics). It means High Bounce rate has nothing to do with the website’s credibility or authority. Therefore, it is essential to concentrate on the Average Visit Duration rather than wasting time in dividing one article into different pages for the sake of reducing bounce rate. Readers hate to navigate different pages to read one article. The Bounce rate of this MBL Blog is also on a bit higher side, but the Average Duration is also perfect. So keeping balance in between both the elements is significant and will benefit a website. If your site is performing well, but the bounce rate is too high, then do not worry just concentrate on building professional content. What are your thoughts about the High Bounce Rate? Take a lot care till then, Peace, Blessings and Happy blogging. Oh yeah, at last i know bounce rate is not so important than visit time duration. Bounce rate !!.. nice topic .. Thanks man ..